I have been to many Old Town White Coffee outlets but never been to this Old Town White Coffee Grand. Actually I found this place accidentally. I was driving to my hotel after training and decided to stop by anywhere on the way and grab my dinner. 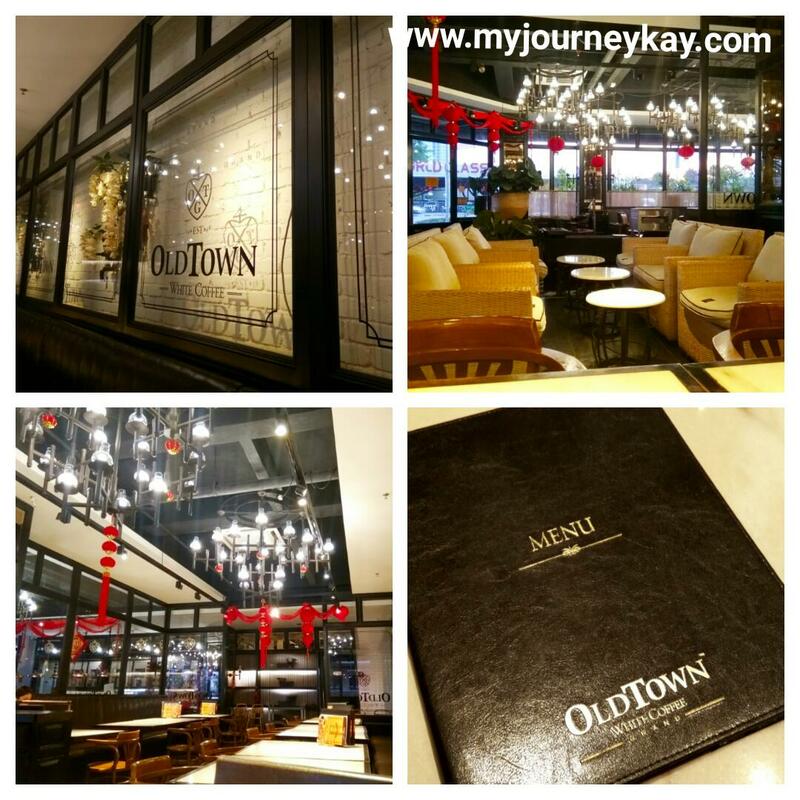 I saw this place "old town" and decided to go have my dinner there. Once I parked my car, I noticed this place looks different from typical Old Town White Coffee Outlets. So I tried to look around and make sure this is really Old Town White Coffee outlet. Then, I walked in and saw this place looked posh with the elegant decorations. I really loved the interior. Took my seat with the thought in my mind that the food is here must be expensive because of the posh look of this place. 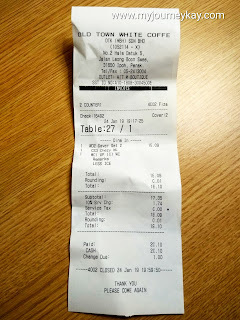 But when I opened the menu, I was surprised because price are similar to the normal Old Town White Coffee outlets. And, there are some menu different from the normal outlets. The cheesy section of the menu attracted me because I am the cheese lover. So, I chose the all day value meal with cheese which is Cheesy Nasi Lemak with a drink. I ordered iced white coffee for drink. The meal came and it looked very yummy. While eating only I realised it is squid sambal and I don't like the big squids. I did not check the menu properly and I thought it is chicken. My mistake. But, it was too late to change the order and decided to continue eating and just pushed away those squids. But, the food was really delicious. 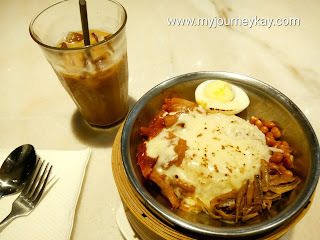 The steaming rice with cheese and anchovies and peanuts and egg with the sambal was so yummy. I did not eat the squid but I took the sambal. The sambal was very tasty and spicy too. And, I asked for extra plain sambal because it was really tasty. The iced white coffee also tasted good. 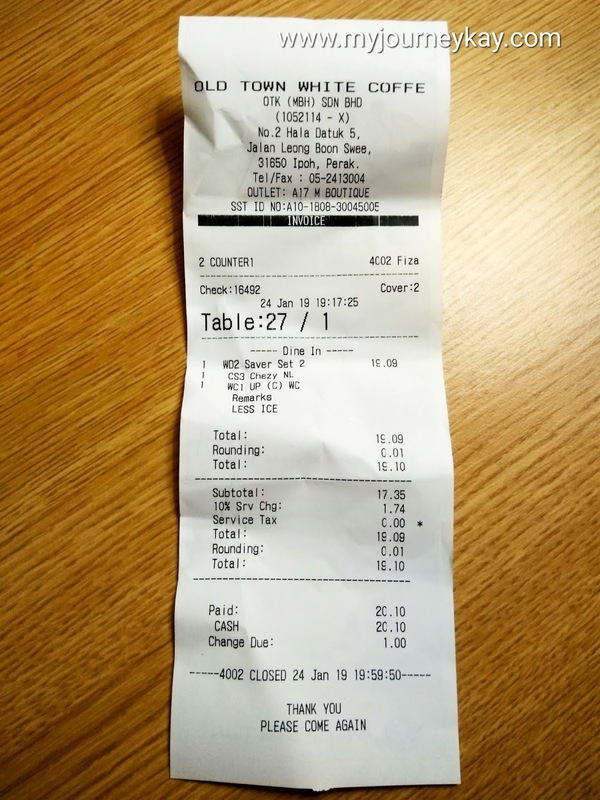 The cost of the meal was RM19.09. Overall, I like this tasty food and this beautiful interior. It is actually a restaurant partner of M Boutique Hotel. Nice place. I am glad I found this place. No.2, Hala Datuk 5, Jalan Leong Boon Swee, 31650 Ipoh, Perak.